After Long Slumber, Philae Says Hi To The World : 13.7: Cosmos And Culture The probe found enough energy to send a signal — which hadn't been guaranteed. If all goes well, we may know fairly soon whether the comet it's on carries the stuff of life, says Marcelo Gleiser. An artist impression shows Philae on the surface of comet 67P/Churyumov-Gerasimenko. In a technological feat that moved the world, last November the European Space Agency landed the small probe Philae on comet 67P/Churyumov–Gerasimenko, which is cruising at some 100,000 miles per hour toward the sun. Excitement turned to high drama when the landing put the probe away from the sun's rays and, thus, from its energy source. 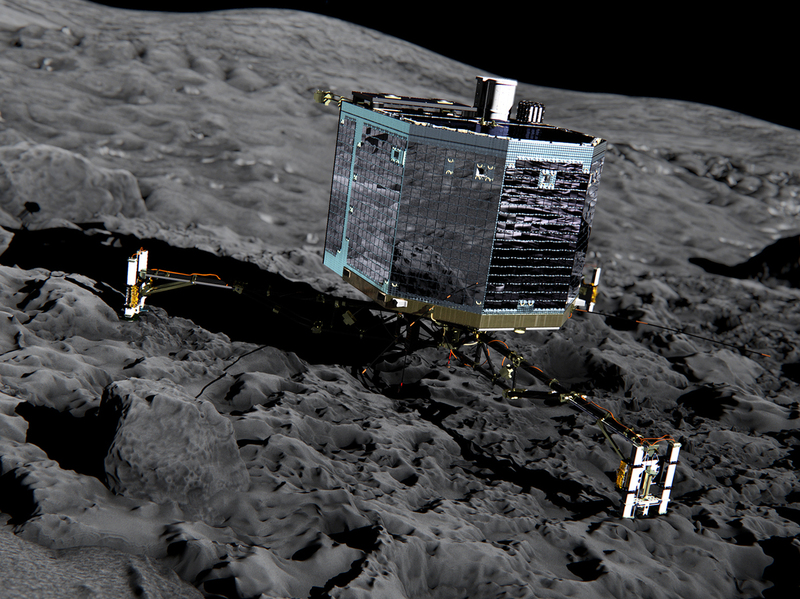 At the low temperatures of outer space, Philae went into a deep slumber, one that many thought would be permanent. Hence the surprise three days ago when the "little probe that could" sent a tweet to its followers: "Hello Earth! Can you hear me?" Moving closer to the sun, Philae's solar panels captured enough radiation to warm up above their operation temperature of -35 degrees Celsius (-31 Fahrenheit). They should have enough wattage available for transmission of much-wanted data about the comet's chemical composition. Philae's amazing mission is to study whether comets could have contributed to the origin of life on Earth. For its first half billion years, all sorts of space debris fell on our nascent planet, including comets. The debris was leftover material from the epoch of planetary formation, some of it still in orbit in "belts" around the sun, such as the asteroid belt, which is made of rocks orbiting between Mars and Jupiter. Comets come from belts placed much farther out, such as the Kuiper belt (in the outskirts of Neptune) and the Oort cloud, at the confines of the solar system. Their distance from the sun affects their composition: Instead of being rocky like asteroids, comets are mostly made of water ice, dust and a few frozen gases — including carbon dioxide, carbon monoxide, methane and ammonia. To study a comet is to dive deep into our solar system's infancy. Their isolation guarantees that whatever they carry has been preserved for the past 4 billion years. And since they bombarded primeval Earth, what we find on them gives us clues of what fell here. Possibly, they sprinkled our planet with the basic ingredients for life. Philae is equipped with a small drill and two mass spectrometers, designed to analyze the chemical composition of soil samples. The hope is that the proximity to the sun will provide the probe with enough energy to carry out the study, identifying some of the stuff on the comet and just below its surface. If carbon-based compounds are found, we will have evidence that comets did participate in making up the primordial soup that gave origin to the first living creatures here. Sure, the jump from simple compounds or even amino acids to a living entity is huge. But without the basic ingredients to jumpstart life, the process would have been that much harder. If all goes well, we should know fairly soon whether comet 67P/Churyumov–Gerasimenko carries with it the stuff of life. As I wrote here last year, we could be "the proud carriers of comet dust in our bones. And, now, we can go up there and collect the original stuff. That's where science becomes magical," all over again.